Invest in Energy Post Productions B.V.
International climate initiatives by non-state actors account for roughly half of the emission reductions pledged by governments, according to conservative calculations made by consultancy Ecofys. Cities and regions provide the larger part of these efforts, companies about a quarter. That is not yet enough to bridge the gap to the reductions that are needed, but there is scope for a further increase, write Rolf de Vos and Kornelis Blok of Ecofys. 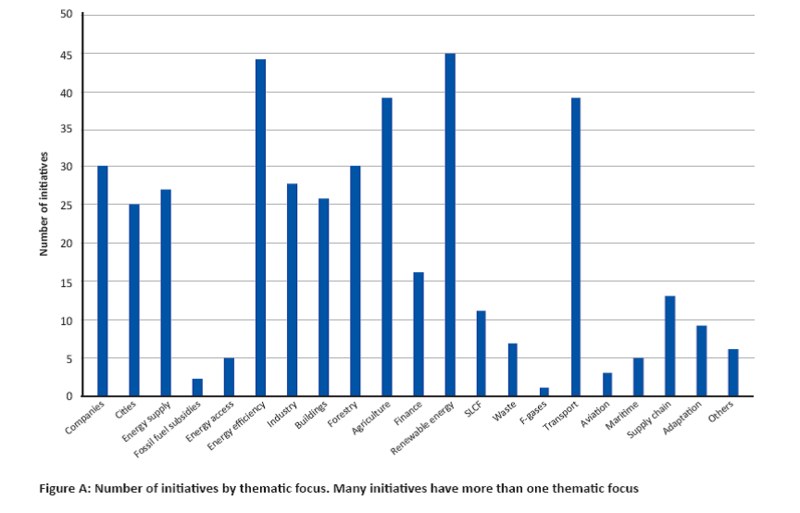 They note that non-state initiatives are becoming increasingly important in the international climate picture. Non-state emissions reduction projects are getting growing attention, even from the policy-oriented crowd at the yearly Conference of the Parties (COP). At the end of COP20, in December 2014 in Lima, the UNFCCC – the United Nations climate office – launched the Nazca database – the Non-State Actor Zone for Climate Action. The database “showcases commitments to action by companies, cities, subnational regions, and investors to address climate change”. To date it lists some 2800 smaller and larger actions from across the world. Another portal for non-state initiatives is the Climate Initiatives Platform, set up by the Nordic Council of Ministers (Norden), Ecofys, the University of Cambridge and the World Resources Institute, which “collects, shares and tracks information about International Climate Initiatives (ICI’s)”. It has registered over 180 initiatives so far, in which over 20,000 organisations are participating. A significant number of them were launched at the UN New York Climate Summit in September 2014. Impressive numbers, but how much impact does this parallel world really have on climate change mitigation? No sound monitoring and reporting system exists that would validate the emission reductions of these initiatives. They are also voluntary and non-binding by definition, so it is hard to rely on them absolutely. Still, companies, cities and other organisations that don’t live up to their own promises do run reputational and commercial risks, so we may expect these initiatives to deliver results. But to quantify those results is not straightforward. In June, UNEP (UN Environmental Programme) published a report of International Climate Initiatives. Ecofys selected the most robust of them, in terms of the concreteness of actions and targets, their capacity to deliver and their targeted volumes of reductions. By applying these criteria, we came up with 15 major initiatives to be assessed in depth, ranging from industrial actions (e.g. the Cement Sustainability Initiative or the Science based Targets) to cities’ initiatives like C40 and the Covenant of Mayors, and broad actions such as en.lighten (phasing out incandescent light bulbs), the New Vision for Agriculture and the Global Alliance for Clean Cookstoves. Of each of these major initiatives, the emission reductions were calculated compared to a business-as-usual scenario, basically defined as complying to existing governmental policies. The initiatives prove to differ widely, so they had to be assessed individually. Also, adjustments had to be made for overlap between the initiatives. 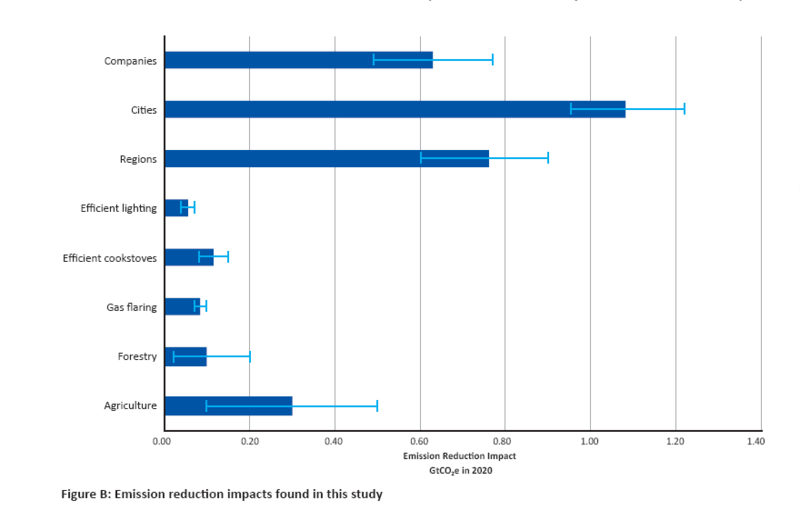 We calculated that the 15 actions will reduce emissions by 2.9 GtCO2e (gigatonnes of CO2-equivalents), with a range of 2.5–3.3 GtCO2e. This is considerable. To compare: all government pledges for 2020 are expected to deliver emission reduction between 5 and 7 GtCO2e by 2020. (Note that this does not pertain to the INDC’s that are now being submitted to the UN by nations – those are for 2030.) So the non-state pledges add up to roughly half the government pledges. This figure still needs some explanation. Firstly, an adjustment for overlap with government pledges has yet to be made, but that is not expected to be more than 1 GtCO2e. On the other hand, some large initiatives are left out of the equation, because we did not consider them solid enough to be counted in. This concerns for example a number of large and promising forestry initiatives that were excluded because of missing or unreliable data, and certain financing actions, for which we could not properly validate the commitment of members. In a next assessment, these initiatives might be included, so it is reasonable to expect higher numbers in the future. As a result, the number of 2 GtCO2 can be regarded as a lower limit. The largest part of this (1.08 Gt) will be delivered by cities. This is not so surprising, as cities produce almost half of the global greenhouse gas emissions. Another 0.63 Gt is likely to be provided by companies. Private companies are responsible for more than 20% of all greenhouse gas emissions. Another 0.05 Gt is saved by replacing old light bulbs with more efficient ones. So where will these private initiatives get us? They will still leave a considerable gap towards what would be needed to stay under the 2°C limit. Last year, the UNEP (2014 Bridging the Emissions Gap Report) calculated that the 2020 gap between the current pledges of governments and a reasonable chance to stay on track for not exceeding 2°C temperature rise was still some 15 Gt. The current total global emission level is around 49 Gt. It definitely will be a challenge to bridge the gap. Nevertheless, it may not be impossible. Here is how it could work: the non-state contributions co inspire states to increase their pledges. In turn, higher national country contributions will allow non-state actors to increase their own contributions, because policies and measures will be in place that will limit their risks towards competitors and voters. UNFCCC boss Christiana Figueres tweeted “Important contribution of non-state actors—encouraging for COP21,” i.e. the Climate Conference in Paris. Non-state and state actors may thus reinforce each other: if non-state actors step up their efforts, governments will follow more easily, and vice versa. UNEP has said it will continue tracking non-state climate initiatives. Here in this blog we will do the same. Rolf de Vos is senior consultant and journalist at consultancy Ecofys. Kornelis Blok is scientific director of Ecofys and professor Energy Systems Analysis at Delft University of Technology. He is one of the lead authors of the UNEP report mentioned in the article. This is the third post in the Ecofys Paris Climate Blog, hosted on the Energy Post website. The Ecofys Paris Climate Blog tries to bridge the gap between business and policymakers in the run-up to the UN Climate Conference in Paris. It looks at how climate policies interact with business and how business can contribute to climate policies. To comment or contribute write to Rolf de Vos (r.devos@ecofys.com, @qqmulti). It is ironic Christiana Figueres is quoted in the article. Last January she made comments to the press that were published by Investors Business Daily February 12, 2015. “At a news conference last week in Brussels, Christiana Figueres, executive secretary of U.N.’s Framework Convention on Climate Change, admitted that the goal of environmental activists is not to save the world from ecological calamity but to destroy capitalism. In climate issues, business and policymakers tend to move in different worlds. That’s unfortunate, because the climate challenge can only be met if private and public actors support each other. The Ecofys Paris Climate Blog tries to bridge this gap between business and policymakers in the run-up to the UN Climate Conference in Paris. It looks at how climate policies interact with business and how business can contribute to climate policies.